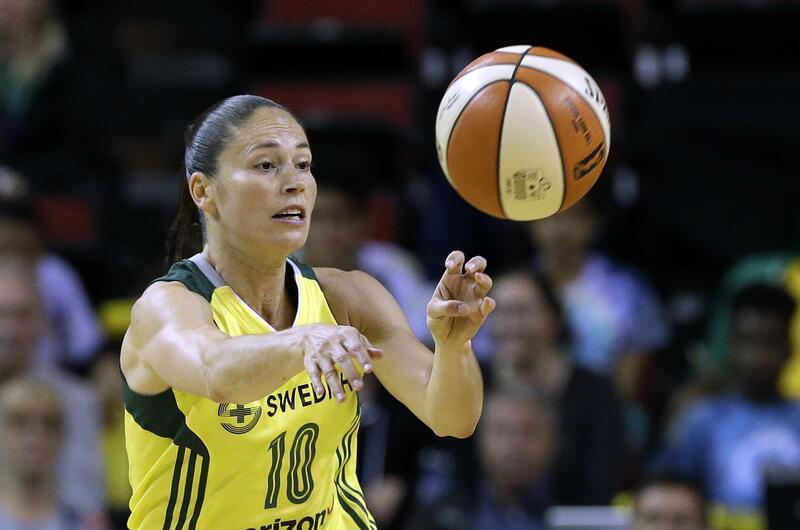 SEATTLE – Sue Bird scored 21 while setting the franchise scoring mark to help the Seattle Storm beat the Washington Mystics 97-91 on Sunday. Bird became the Storm’s all-time leading scorer with her 13th point of the game, passing Lauren Jackson (6,007) on a pull-up jumper with 7:33 left in the third quarter. Bird also moved ahead of Jackson to seventh on the all-time WNBA scoring list, behind Lisa Leslie (6,263). The Storm outscored the Mystics 27-10 over the final seven minutes of the third quarter to lead 75-66 at the end of the period. Seattle extended its lead to 88-74 on Breanna Stewart’s 3-pointer with 4:18 to go. Elena Delle Donne’s step back 3-pointer closed the deficit to 95-89 with 25.1 seconds left but the Mystics got no closer. The Mystics led 56-48 on Kristi Toliver’s 3-pointer after a 10-4 run to open the third quarter. Stewart had 25 points and 10 rebounds to lead Seattle. Natasha Howard added nine points, including the 1,000th of her career. Delle Donne scored 29, Toliver added 18 and Ariel Atkins 17 for Washington. Published: July 8, 2018, 7:38 p.m.